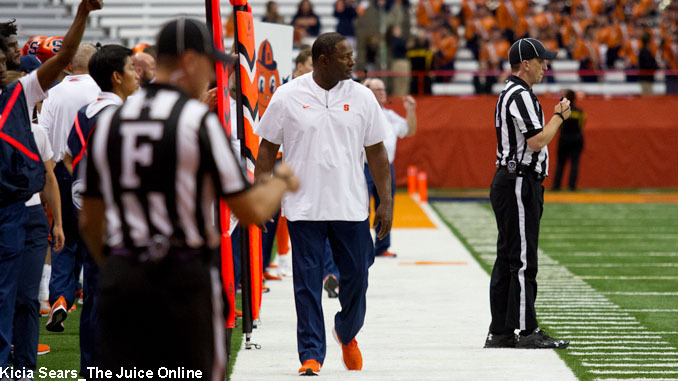 Syracuse coach Dino Babers looks on from the sidelines. Mandatory Photo Credit: Kicia Sears, The Juice Online. Item: The words echoed mightily when we heard them mentioned during ESPN/ABC’s broadcast of Clemson’s romp over Pittsburgh in the ACC Championship game Saturday night: “Besides Clemson, the only other ranked team in the ACC is Syracuse.” In a season of unfortunate timing, in which the conference’s automatic tie-in to the Orange Bowl is occupied instead by the College Football Playoff national semifinal game between Alabama and Oklahoma, according to the conference’s 2018 bowl hierarchy, Orlando and the Camping World Bowl was the ONLY deserving landing spot for this Syracuse team, symbolic of being the rightful second selection behind conference champion and Cotton Bowl C.F.P. semifinalist Clemson. As usual this past week in the annual college football season calendar, there was plenty of behind-the-scenes wheeling and dealing sorting out the bowl game scenarios dependent on the final games of the season to be completed. A large amount of time was spent talking/texting/conferencing between league offices, their TV network partners and subsequently major sponsors and partners, and athletic director’s offices all around the country. When the non-College Football Playoff and New Year’s Six bowl pairings were announced Sunday afternoon, it was clear the ACC took care of highlighting both of its 9-3 teams, Syracuse and North Carolina State, placing both schools within “relatively” easy-to-reach Florida (certainly for Sunshine State alumni bases) in the Camping World Bowl against West Virginia and the Gator Bowl versus Texas A&M, respectively, matchups that please the bowl game committees in Orlando and Jacksonville, the ACC, Big XII, and SEC, TV partner ESPN and its major bowl sponsors, and players/coaches/staff and fan bases that yearn for warm weather. For Syracuse and West Virginia in the Camping World Bowl, it is game two of three in the Friday, Dec. 28 ESPN TV window and a scheduled 5:15 p.m. ET kickoff, with the Arizona Bowl between Nevada and Arkansas State is simultaniously being played in Tucson on CBS Sports Network. It will be interesting to see how many tickets SU and WVU sell for this latest incarnation of also (unofficially, according to the bowl) battling for the Ben Schwatzwalder Trophy for the first time since the ‘Cuse win in the 2012 Pinstripe Bowl, as compared to the Citrus Bowl game to be played in the same stadium four days later between Kentucky and Penn State (the stadium also hosts the Cure Bowl between Tulane and Louisiana on Dec, 15). It’s likely not many West Virginia fans, who have to do a lot of traveling to the Midwest and Southwest each season just to see the ‘Neers play in Big XII road games, didn’t travel well to Dallas last season when WVU fell to Utah at the old Cotton Bowl stadium (not the Cotton Bowl game at AT&T Stadium in Arlington) in front an announced crowd of only 20,507, but will be prone to head to Orlando in a couple of weeks instead. Orange Nation is rapidly climbing aboard the Dino Babers express to central Florida, starved for the relevancy that comes with an annual return to postseason play, this year in particular looking to salute Eric Dungey and the 2018 senior class for building the foundation of the program’s turnaround. “I do appreciate the slotting of it (placing SU in the Camping World Bowl by the ACC) because that’s where the second team in the ACC normally (for 2018) goes, and that’s what we earned this year,” Babers said Sunday following the official bowl announcement from the ACC and the university. The other great domino effect of the chance to win 10 games in a season for the first time since 2001 and for only the sixth time since the end of World War II, and right in the smack of Florida’s fertile recruiting territory, is the increase in the level of talent open to hearing about the ‘Cuse. Babers said Sunday half of his 2019 class is committed, and the journey to fill the other half has taken a positive turn. With a well-earned Camping World Bowl destination to enjoy, and one final game to leave a lasting legacy with a 10-3 final record.